The SEMA show is a celebration of the multi-billion-dollar aftermarket car tuning and styling industry and is held every year by the Specialty Equipment Market Association (SEMA) in Las Vegas, Nevada. This year’s event runs from November 4 to 7 at the Las Vegas Convention Center. Toyota has been a long-time supporter of the SEMA show, an event that last year attracted over 60,000 industry professionals. It is the ideal venue to demonstrate personalisation options, particularly through the manufacturer’s official TRD range, not to mention the adaptability of Toyota vehicles to everything from camping excursions and off-roading to circuit driving and drag racing. Headlining this year is this stunning targa-roof GT86 concept built by Jeremy Lookofsky of Cartel Customs. The attractive black-over-blue paintwork draws you in to appreciate its clever use of the model’s distinctive swage lines, as well as the adoption of a retro-tastic TRD rear louvre panel. But closer viewing reveals a more muscular all-metal body with vented front wings flowing seamlessly into new side skirts, plus an integrated rear spoiler and high-mounted centre-exit exhaust system. In the engine, a turbocharger conversion is employed to deliver a significant boost in power, while multi-adjustable suspension gives the chassis a track-tuned edge as well as a lower stance over the new 19″ forged alloy wheels. And what better way could there be to enjoy this exhilarating drive and beautifully appointed tan leather interior than with a clear view of the sky above? 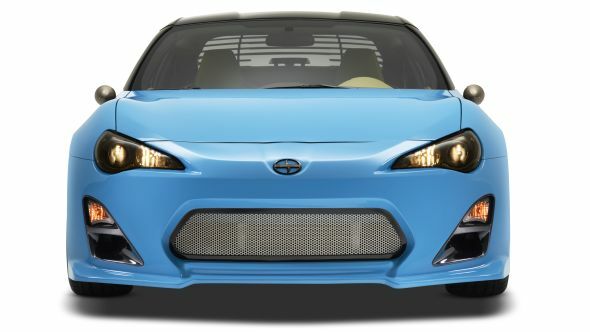 The 2014 SEMA show is also special for marking the tenth anniversary of the popular Scion Tuner Challenge, hosted by Toyota’s youth brand in North America. 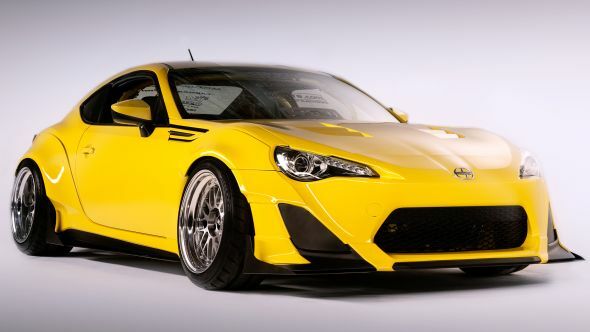 This year the process involved donating a GT86 and $15,000 to each of three leading media outlets with the challenge of building a show-stopping demo vehicle for the Scion stand in just three months. 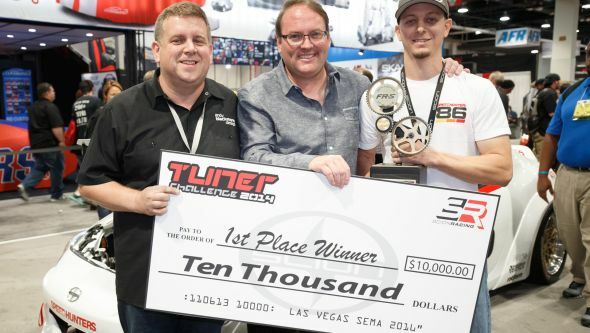 Historically, projects built for the Tuner Challenge generate incredible media attention but an additional incentive this year was a $10,000 grand prize for the vehicle judged to be the best of the bunch. The Super Street GT86 uses a bold, street-inspired exterior aesthetic that combines official TRD parts (bumpers, side skirts and headlights) with a Rocket Bunny wide-body conversion and lightweight panels from carbon fibre specialist Seibon. In contrast, the chassis and interior draw inspiration from motorsport. The former wears arch-filling split-rim BBS alloy wheels, multi-adjustable suspension, and what appears to be the entire catalogue of Whiteline alignment components. Meanwhile, the interior is equipped with a six-point roll-cage and figure-hugging bucket seats. Perhaps the boldest move is the minimalist engine bay, which has been relieved of all unnecessary ancillaries. Thanks to clever hidden routing, it even appears that all wiring and plumbing systems have been deleted, so that the engine – which itself is now breathing through individual throttle bodies – appears to be floating in a broad, unbroken framework of yellow. 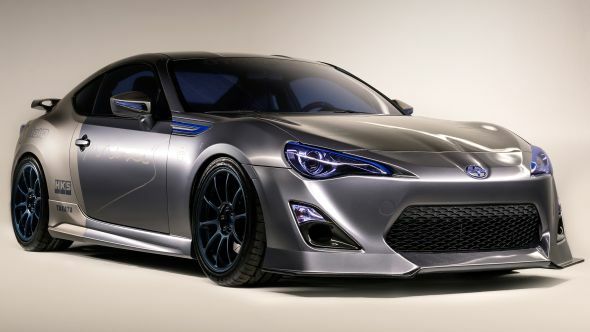 The GT Channel project treads a different path to the motorsport-inspired style of most ‘tuner’ GT86s. Its clean, sophisticated look is designed to enhance the model’s natural ability so that it remains appealing in every circumstance, whether that be an occasional track day or the daily commute. Beneath the standard-width bodywork lies a number of functional, aero-enhancing components, from the new Esprit front bumper, Avest mirrors and rear spoiler to an ensemble of Seibon carbon fibre panels. Functionality also extends to the chassis, which features tough, fully adjustable assemblies that give the GT86 the ability to remain composed whatever is thrown at it. Any doubts about this car’s performance were obliterated on the dyno, where its HKS supercharged induction, lightweight crank pulley and free-flowing Ganador and 5Zigen exhaust combo helped it produce a punchy 223bhp at the rear wheels. 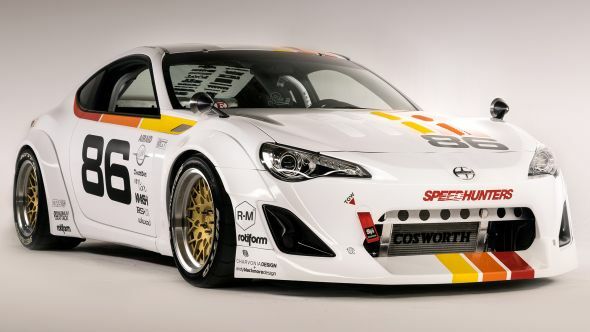 The Speedhunters collective of photographers, writers and drivers has put together arguably the most eclectic GT86 of the trio, fusing inspiration from vintage TRD components and modern TRA Kyoto (Rocket Bunny) styling, to Trans-Am racers, touring and muscle cars. Mixing modern and retro is not an easy task. But with key ingredients such as bolt-on wide arches, wing-mounted mirrors, louvred bonnet, relatively small diameter wheels with thicker tyre side walls, and period graphics, the overall look has come together with fantastic cohesion. With a pre-production Cosworth supercharger installed under the bonnet raising the engine’s output to a claimed 300bhp, the Speedhunters GT86 also has the go to match its show. A fact underlined by the stripped-out interior that is so highly focussed it only has room for one. With thousands of votes cast online and in person at the show, the Speedhunters car was announced as winner of the 2014 Scion Tuner Challenge. Second place went to Super Street and third to GT Channel.